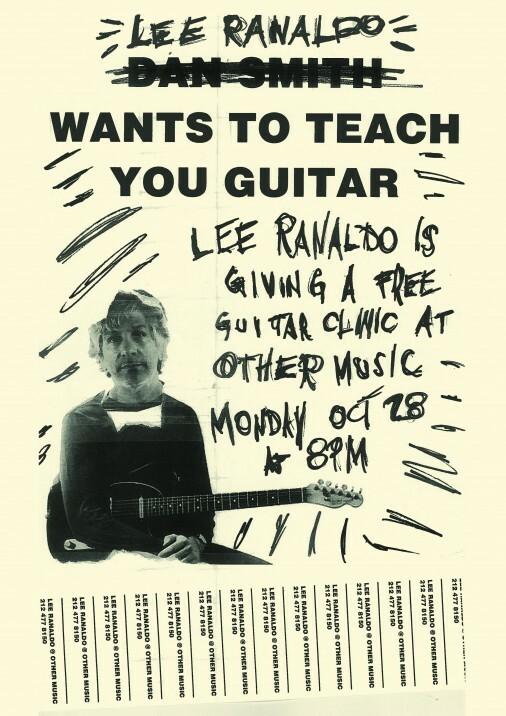 As evidenced by his catalog of work – especially his newest album Last Night On Earth – Lee Ranaldo knows his way around a guitar. And he wants to share some of his knowledge with the good people of New York City. Monday October 28 at 8pm make you way to Other Music where Lee will be hosting his first Guitar Clinic, having a discussion and demonstration of his weapon of choice. What’s more, you’ll not only walk away with a new found respect for and knowledge of the Axe, you’ll also walk away with a signed poster. Shithotdamn. I baught my first sonic youth album,sonic youth about 92 and was really moved and inspired but Im still not very good at the guitar. Show this online for the little rest of the world! ditto, please show this online! Next Next post: Cat Power Solo Shows in November!